Named for the farmer who owns the isolated land where the trees grow, hand picked Fortunato No. 4 beans must be brought to fermenting and drying areas first by foot, then by burro, to motorcycle, and finally by all terrain vehicle. After years of site visits by specialists and over eighty drying and fermenting trials, the proper processing technique for the rare porcelana beans was determined, and the beans were brought to a renowned Swiss chocolatier able to use a special, very old conching machine to grind the beans in a manner that preserves the nutty, floral, and tropical fruit of Fortunato’s terroir ~ the unique flavor profile that comes from it’s soil. As you taste this wonderful 68% Grand Cru, attend to the layered flavors, with citrus, coffee and spice notes emerging, and especially to the lingering cocoa butter flavor that lasts well beyond that of other fine couveture chocolate. Just a handful of artisan chocolatiers worldwide have been entrusted with this extraordinary chocolate, and Patricia’s Chocolate is honored to be one of only a few chocolatiers on Earth able to bring this exceptional delicacy to you. For more information about the finding of Fortunato’s Pure Naçional, including videos of the farm, interviews with the discoverers, testimony from members of the scientific community, and links to worldwide press coverage please click here. 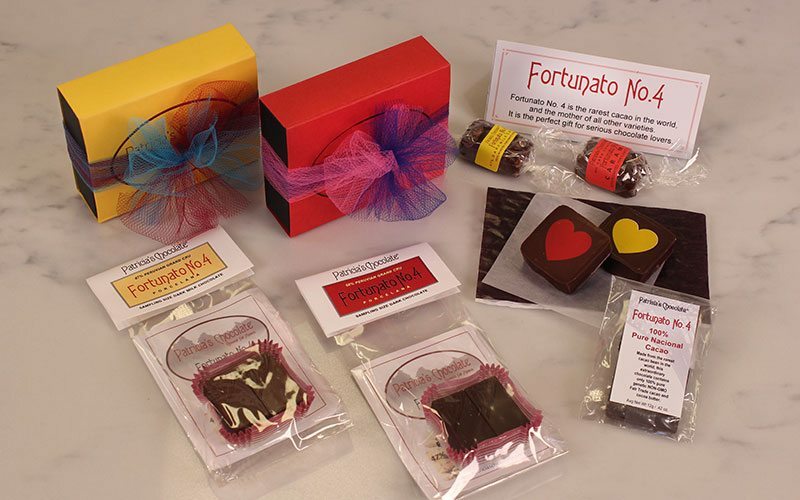 Purchase Patricia’s Chocolate Fortunato No. 4 today!